Our hotel is in the Playacar area that is about 30 mins from Cancun. We have stayed in this area before and we always love it. It is more like staying in a nice neighbourhood instead of being off the main highway. When we walk out of our hotel it’s like walking on a street at home. Every night we are able to go for a walk. There are always a lot of people out and about and there is a small shopping plaza about 2 minute walk from our hotel so you can pretty well get anything you need. The best part about it is that you are just a 20 minute walk from Playa Del Carman so you can go into town whenever you like and to take a taxi back is 90 Pesos so about 6.00. There are also lots of bikes available if you prefer not to walk into town and a bike stand just as you enter Playa Del Carman. The area has lots of different hotels to choose from. They also have a couple of golf courses in the area that we walk past everyday including the Hard Rock Golf Club. We love that we can leave our property without having to take a cab. To see the full beauty of the RIU Palace Mexico check out my resort tour here https://youtu.be/Mjznc4ubGVQ. A cheap (poor) girl’s first really luxurious experience! Yesterday mom and I were lying by the pool, fully planning to spend the entire day doing just that (OK probably not, I would have gotten bored eventually). Along came some members of the spa team offering “five minute free massage”. I instinctively declined knowing that it would be a trick for sure. Mom chose the opposite, which ended in both of us getting our five minute free massage, and the two of us being booked into the spa for the promotion of the day for later that afternoon. Apparently my mother felt the need to spoil me? I hardly go for massages in Saskatoon and they are even covered by my health plan! Getting my hair done more than three times a year is my level of personal pampering, ha-ha. Later that day when it was WAY TOO HOT to sit by the pool anymore anyway we ventured into the spa. We were greeted with Hibiscus Water while we filled out our forms and then taken to the change room with lockers. In each of our lockers was a towel, robe, pair of sandals to wear inside the spa, a basket to put your valuables, a bag to hold your wet garments and the key on a fancy little bracelet. WOW! After we changed we were led to the “relax” room which was a room with some comfy chairs and sofas and quiet music playing (relaxing right?). We were given warm shoulder bags (bags filled with beans or something, and they smelled like tea… I don’t know what it was but it was nice) and offered something to drink. 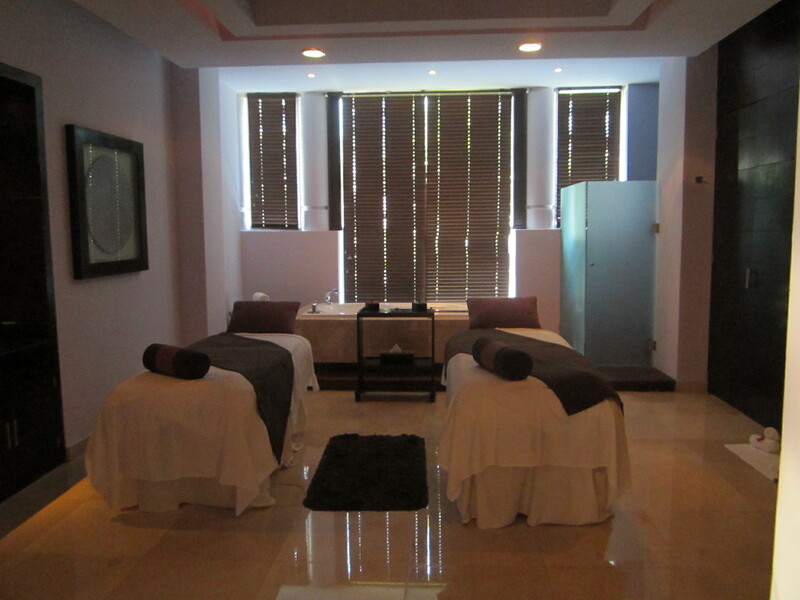 After a few minutes we were led to the room for our massage. It was beautiful. This picture is what it was like but not necessarily the exact room (from my hotel tour earlier this week). We were told to sit on a sofa and warm towels were placed over our faces. They did some aromatherapy stuff, rubbed our feet and wrapped them in warm towels and let us relax there a while. Then we moved on to the actual massage. It was lovely very relaxing and far more enjoyable than anything I have experienced at home (less therapeutic and more relaxing I guess you could say). They even gave me a scalp massage! After they were done they waited outside the room with tea and took us back to the relaxing room to sit with the warm bean bags again. All in all it was just a whole level of pampering that I have never experienced before! I’m blown away. I wish I could say that I will be doing this more often but to be honest my “vacation spending money” tends to be saved for other things… like shopping, tipping, cabs, excursions etc. That said; if you are spa person, or a person who isn’t interested in leaving the resort much I think it’s a great thing to do on your vacation! I absolutely enjoyed every moment of it was truly luxurious! Speaking of Tipping. Just a note about the excursion we went on the other day. Mom and I discussed how much to tip and I figured $20.00 was reasonable; $10 for the driver and $10 for the guide. Everyone filled out their comment forms and handed them back to the guide with some kind of tip while we drove back to our hotels. I watched as the guide counted out the money between the two of them. I was shocked and disappointed to see that some couples in our van honestly only tipped around $5.00. It was really sad to think that these people (some staying at the RIU Playacar Palace) didn’t feel that these men deserved more than that. They had a really long, hot day and did a wonderful job of keeping us entertained, fed, comfortable and informed. Anyway, there’s my rant. Yesterday we went shopping in Playa del Carmen. I am pretty sure we walked the entire 5th Avenue. The cab cost us $15.00 and we were dropped off right at one end. We were there by 10 AM and it was very quiet. There is a TON of shopping here so it’s hard to know where to start. We found that the shop owners were quite a bit more aggressive than the ones in Puerto Vallarta this past February. They also were a lot less willing to barter, (I’m sorry if I paid a certain price for the same type of knock off sunglasses or bracelet in Puerto Vallarta I expect a similar price here! They actually tried to tell me it was a different country; ah no I’m pretty sure it’s still Mexico!). There were a handful of other shops (Roxy/Quicksilver, miscellaneous shoe shop, a sporting goods shop, some name brand kids clothing etc.) if you wanted to shop for that type of thing, but for the most part it was either small souvenir shops where you bartered or giant souvenir shops where the prices were posted. You will pay less in the store with the posted prices almost every time so if you don’t barter for fun, don’t bother. I returned to the hotel with what I had set out to get. A new hat (it was necessary), new sunglasses (because I’m addicted), a key chain with my Mayan zodiac symbol and a Christmas ornament. I somehow also have acquired new earrings, probably because mom was spending too much time in a jewelry store and it was TOO hot to wait outside. Or maybe the guy selling them was ridiculously cute… oh well supporting Mexico’s economy is all part of being a tourist! We had fun in Playa del Carmen and did see the beach (personally I am not a fan of crowded public beaches so we didn’t hang out there). Mom commented that she wouldn’t like to stay right there because you would constantly be badgered by the people trying to sell things whenever you left your hotel. I have to agree but can see a lot of benefits to being that close to shopping, bars, other hotels, etc. too. I guess it just depends on the type of vacationer you are. Hola, blogging by the pool! Its ultra hot out already, actually I don’t think the heat really reduces in the evenings…. Imagine me on a bike riding through the jungle full of Mayan Ruins! For anyone who knows me they know this is the very best moment of my life (so far). That was me Tuesday. 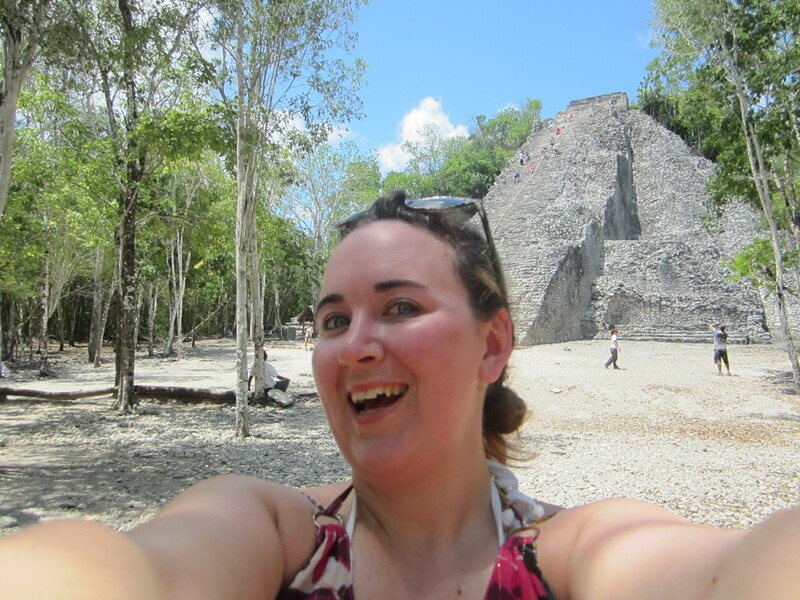 We purchased the Mayan City Tour for a little under $100 per person and it was fantastic! We were picked up at 7:10 AM and joined by 3 couples from other hotels then continued on to Tulum, a Mayan Village, Coba and Akumal. I love history that I can feel and this was definitely one of those days! The moment we arrived at Tulum and our guide brought us through the wall I was completely pumped by what I saw. 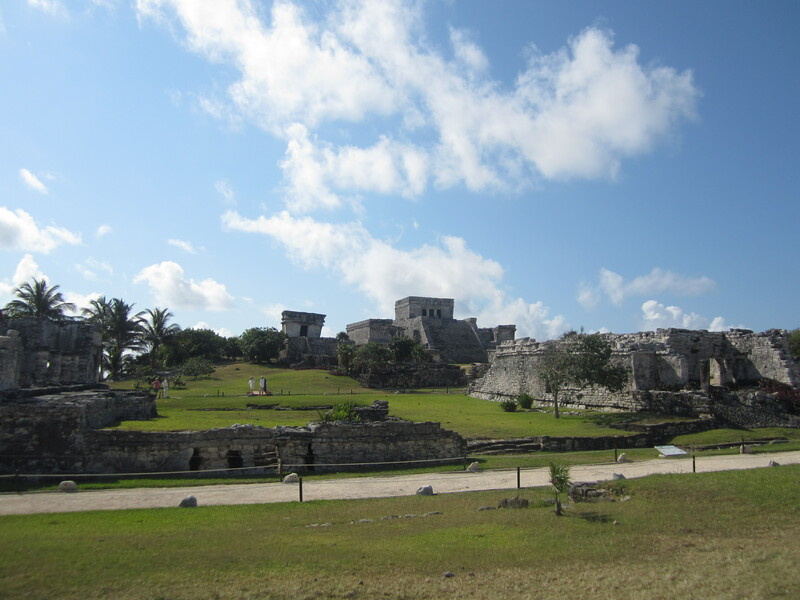 So many of the buildings are still in really great shape considering Tulum is an ancient port city on a cliff. Think about how many hurricanes must have smashed through there. The Mayan Village was a really interesting experience. The community that we stopped at was a couple of houses on the side of the road in the jungle. One family lived there. This family had six daughters and eight sons. Of all of the tours I’ve been on that have stopped at a “typical farm” this was by far the poorest. They did have a creepy monkey as a pet though. The monkey wrapped itself around the baby sleeping in a hammock to protect him from us. 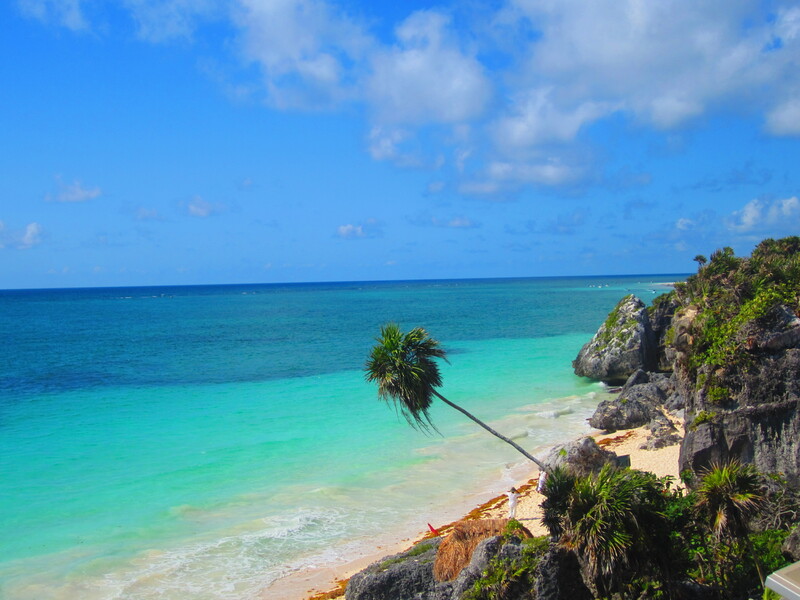 The amazing view from Tulum! Coba was HUGE! This was where I could really feel the history all around me. I could see the place where human sacrifices were made and the temple where the very important people went to be closer to the Gods. It was so big that we had to rent bikes (or you could have someone drive you on their passenger bikes) to get from the main temple and ball field to the infamous tower that you can climb. The ride was great, the path only has other cyclists and people walking on it so you don’t have to worry about traffic really (AKA I was a far calmer driver than I would be in Saskatoon). It was a beautiful ride with the occasional temple along the way. The 40 degree heat didn’t seem so bad in the jungle. Then we turned a corner and there was this giant temple. I climbed about 4 steps and remembered my extreme fear of heights (more like extreme vertigo). Perhaps if it had been cooler out I would have made it higher, I’m sure the view from the top was outstanding. – If you visit Coba, get a bike. It is not a short path to the pyramid and you don’t want to waste your energy, in case you are a climber. – Use bathrooms when your guide suggests, obviously they are hard to find at ancient archaeological sites! 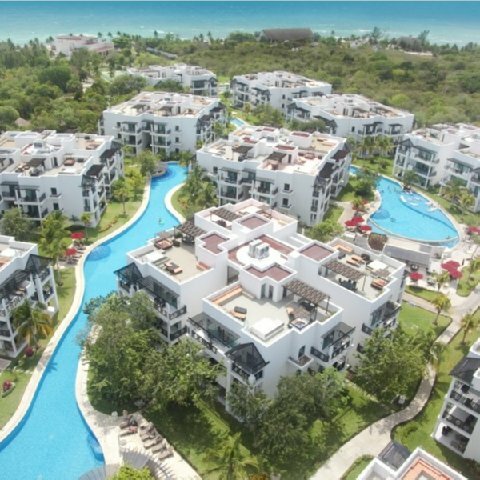 I am hanging with my mom at the Azul Fives by Karisma in the Mayan Riviera. This hotel is by far the nicest we’ve ever been to. After check-in late yesterday afternoon we walked into our room (which is bigger than my apartment in Saskatoon by the way, no I’m not joking) and all we could say was “wow”! It is beautiful, beautiful, and beautiful! This hotel offers both all-inclusive and regular accommodations so the room comes with a full kitchen, two bathrooms, a dining room table that can seat eight, two flat screen tvs, a king bed and a big couch with a pull out bed. SO MUCH SPACE! We saw a group of five girls in their 20s today and figured they probably are sharing one room. Why not? I can imagine doing it with my friends! 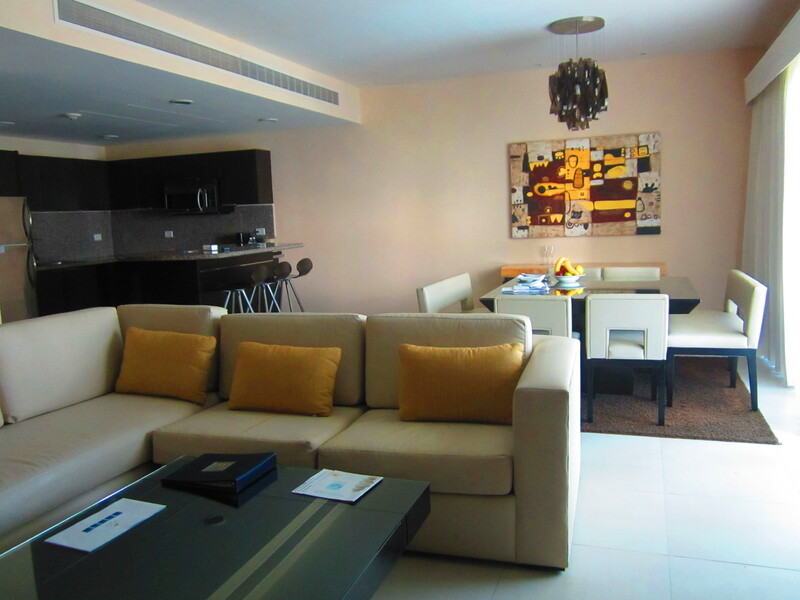 Azul Five by Karisma – our living room! We’ve been here for a day and a half but here are some things that stand out so far. The people: Never in my life have I said “Hola” so many times in a day! It seems that everyone employed here genuinely loves their jobs and is happy to see us. I really refreshing change from other destinations and hotels I’ve visited. It is such a warm inviting feeling. 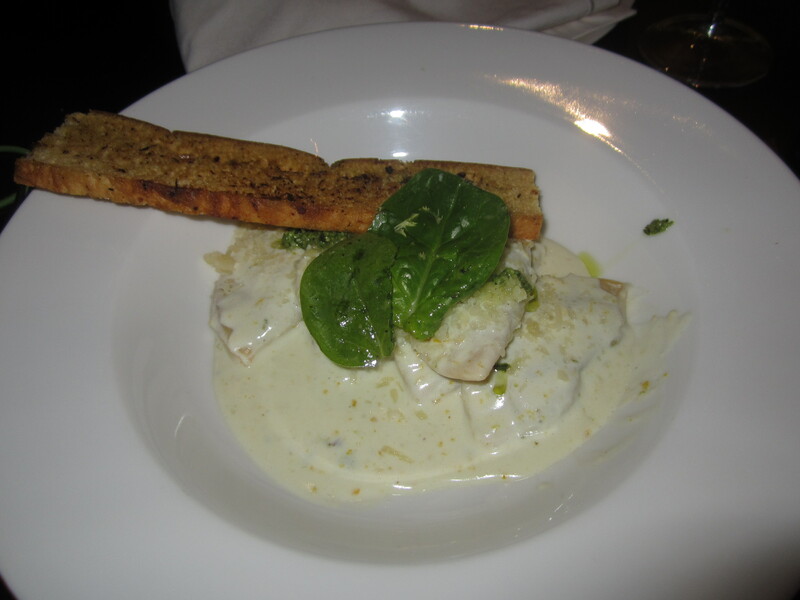 salmon and spinach perogie – Yum! All of the other food has been really good so far so I can’t wait to see what else I can consume before the end of this week. Mom is blown away with how well this hotel is maintained. The vegetation is lush and groomed, the buildings have been recently painted, and everything is perfect! One thing Mom is loving, and I’m not loving as much, is the heat and humidity. I like it hot but this is HOT! All I can say is if you want to visit Mexico in the spring/summer stay hydrated and near a pool! I’m probably going to die or become a lobster by the end of this week, I’ll keep you posted (no burn so far but I was ultra careful today and the sun was mostly down by the time we arrived yesterday) considering we saw SNOW in Calgary on the way here I will take my chances with the heat!